Scheduled Ancient Monument Number 46327. 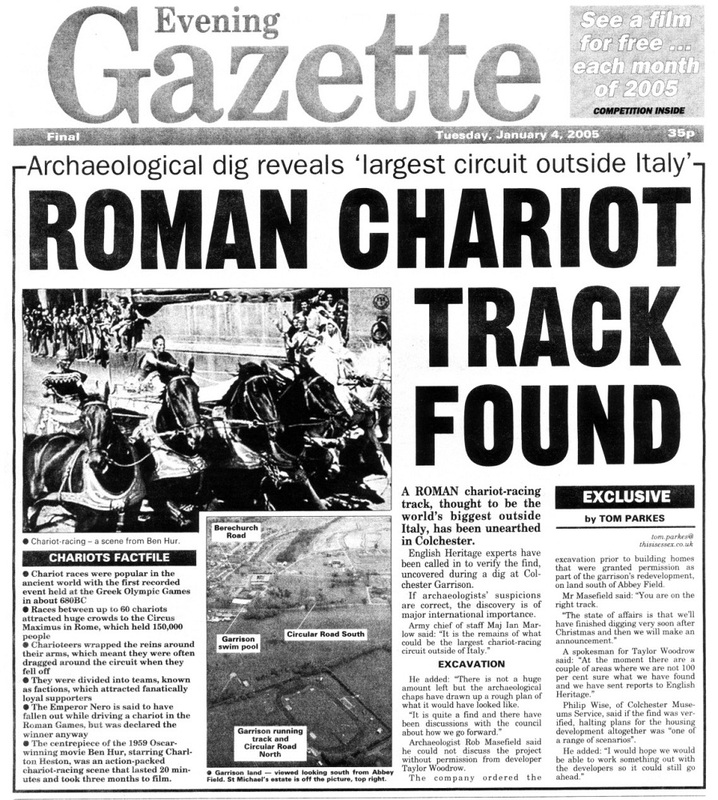 In January 2005 there was great excitement in Colchester when it was realised that archaeologists had discovered Britain's only known Roman circus; a race track for charioteers dating back to perhaps the 3rd century AD. 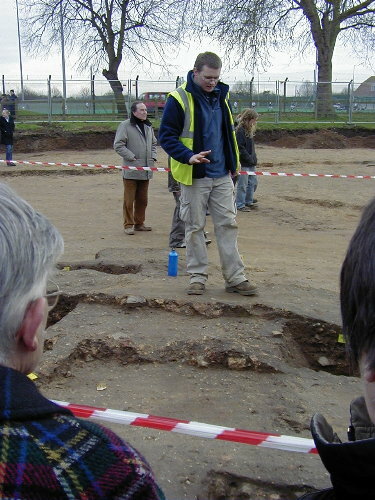 Hundreds of people visited the archaeological excavations and open days and public lectures, to learn about what was being found. Week by week, more and more was being discovered and interpretations made. Here follows a series of web pages of newspaper articles and pictures covering the findings. Sadly, the circus is threatened by property developers and an apathetic local authority. Here follows an amateur's view of the most remarkable archaeological find that has been made in Colchester for many years. Some claim to have predicted it. 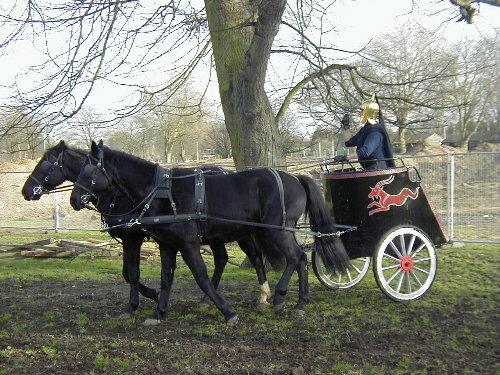 Whatever the case, the discovery of the only Roman circus (The Circus Victricensis) in Britain, the largest known outside of Italy, not only underlines just how important Colchester was during the Roman occupation period, it redefines Colchester as the most unrecognised of all World Heritage Sites. The following press cutting details the latest thinking on how the circus once was. We start our web page with some of the press reports that followed the initial discovery of the circus and realisation of what it was, with pictures and comment from the hugely attended public open day on Saturday 22nd January 2005. If you are interested, other press cuttings are shown here. The following is my (Sdapeze's) account of what I saw at the open day. 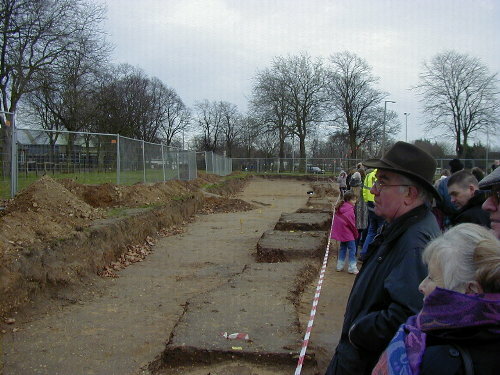 There must have been thousands of people attending as, when we arrived the queues were long and were to get much longer - obvious panic setting in with those of the Colchester Archaeological Trust as to whether they would be able to cope with so many people. 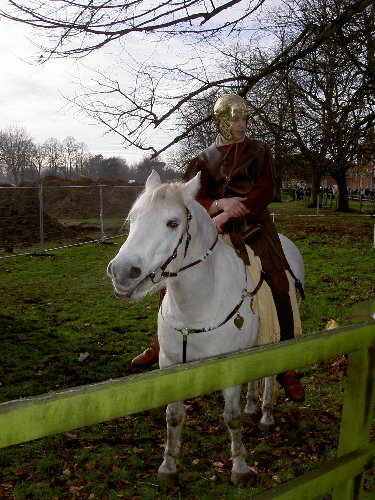 Whilst queuing, we were entertained by the antics of a charioteer with his modern version of a Roman chariot, preceded by a more authentic Roman cavalryman with his horse with phallerae and an absence of stirrups. The following picture was provided courtesy of Harry Royle, as I was too late to take my own. Thank you Harry! We began our tour with a warm up session with Kate Orr of CAT who explained what we were about to see and some of the background to the archaeology of the general area. The circus lies parallel to the town walls, some 400 metres to the south and appears to neatly separate a known area of a Roman cemetery from the town. For this reason the circus and the cemetery are believed to be of the same period. 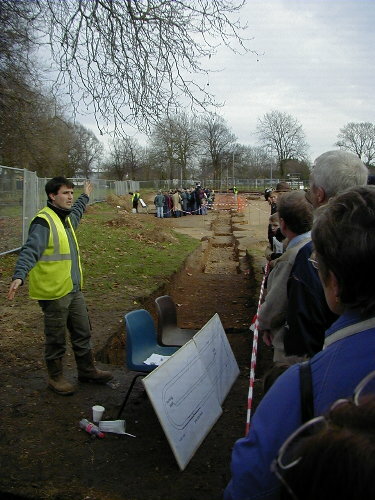 The following picture looks east along the line of the outer wall with Ben Hooloway of CAT explaining the archaeology. Every 4 metres there was a buttress, although most of the masonry had been robbed out during the late 12th century (dateable from pottery finds in the backfill), probably to build the nearby St John's Abbey (now long gone). 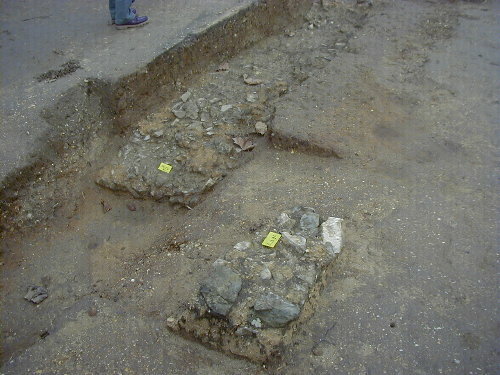 A good area of intact Roman masonry was found although all of it is in very unstable condition, much to do with the high acidity of the soil in this area. The plan view below shows the area where we were standing (in actual fact, this has since been disproved, the starting gates being at this end) with evidence of the curve just having been defined and continuing to be mapped by geophysical surveying. 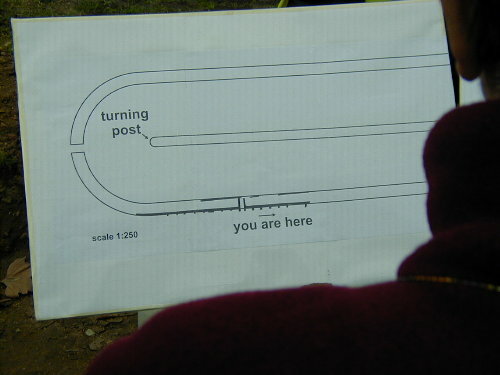 A tree approximately 50 metres to the north had been marked to show where the turning post is likely to have been. The following picture shows some of the masonry that the robbers had left intact. It is of green stone, an inferior type of material to the septaria used for the town wall and which suggests a date of building in the early 2nd century AD, perhaps during the Emperor Hadrian's era (117 - 138 AD). This would fit nicely with the ending of the building of the town wall around 80 AD and give continuity to the gainful employment of otherwise underutilised soldiers. 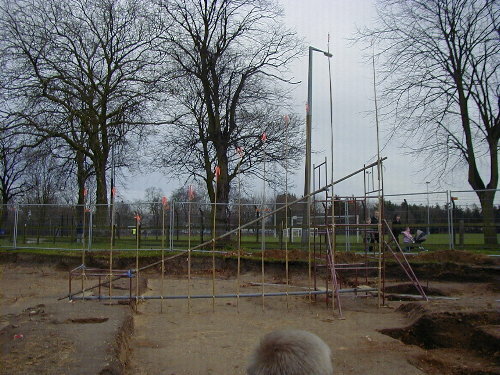 The overall size of circus victricensis can only be guessed at at this stage, due to the starting position to the east not having been discovered yet. 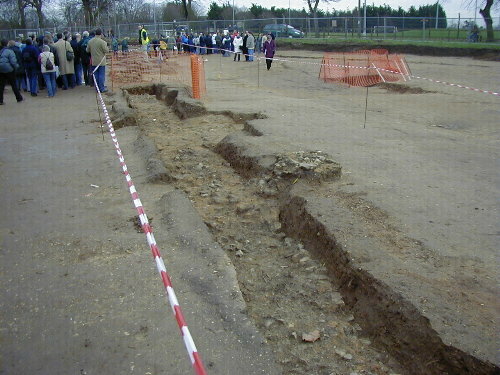 However, the Mersea Road is a know Roman road and it is likely that the starting gates would have been close to this. Also, comparisons can be made with other Roman circuses of the Circus Maximus in Rome and at Sagunto in Spain. Another view below shows the robber trench and evidence of the buttressing on the outer wall, quite similar to the theatre remains at nearby Gosbecks. Below is the area of the inner wall, a much less substantial affair as it was less load bearing for a lower level of wall. In the picture below, Chris of CAT explains the features of what appears to be one of the entrance gates or doorways onto the terraced wall system. 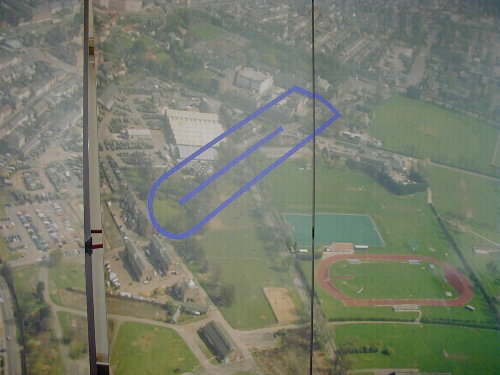 The picture below shows a mock up of the suggested angle and height of the 8000 - 10000 capacity audience seating, perhaps 5 metres high at its highest point. 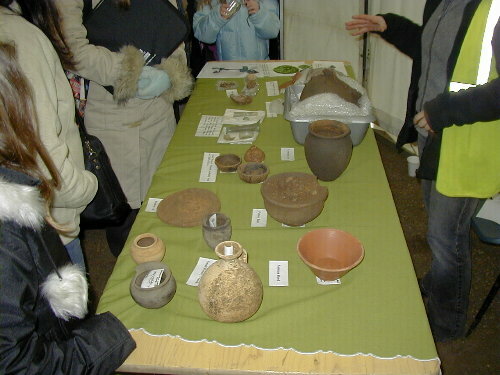 .......and so back to the exhibition tent where various finds were on view, mainly from an adjacent cemetery that had been discovered as part of this excavation. Below is an aerial view of the site with an overlaid image of how the circus would have lain (again, this is a wrong intepretation as later excavation has shown the orientation to be 180 degrees out). Of course, only a fraction of the whole thing has been uncovered and this will be an ongoing excavation as and when access is permitted. The dig is due to come to an end within a few weeks and the intention seems to be to cover up the site to protect it from the ravages of weather. Hopefully, the general area will be kept as open space, with markers to indicate what lays beneath. There are plans afoot for displaying the various finds at the nearby Taylor Woodrow headquarters and further news of this will be placed here when details are known. The project is being managed by RPS Planning, Transport and Design and the investigations are being carried out on behalf of Taylor Woodrow, who are funding the work.